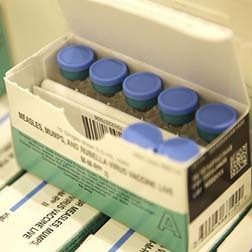 Measles cases this year are already approaching record-breaking numbers; the reason why, more and more people are opting not to vaccinate. New York is dealing with dozens more cases in the past week alone. Cases have been reported in 15 states, fortunately, North Dakota is not on that list. We sat down with a family physician from CHI St. Alexius, who de-bunks some of the concerns of anti-vaxxers. Laura Archuleta, MD; Family Physician: "Some of the anti-vaccine literature that's out there looks very convincing. If you start checking their resources, and going to the sites they quote, you'll find that the science just doesn't stand up." The odds of dying from the measles vaccination are a one in a million chance. On the other hand, the vaccine is 99 percent effective at protecting you from getting the disease.